CloudHawk expands the already capable environmental monitoring solutions by Enviromon to allow you access to your sensor data in real-time as well as setting up SMS alerts to a list of smartphone, or cellphone numbers. 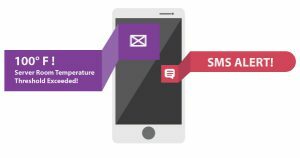 If monitored environmental conditions change, or go beyond your pre-set thresholds CloudHawk will send SMS text-messages to alert you. Want to try CloudHawk service for yourself. Try our online demo here.